The Hazard 4 Evac Plan-B Sling Pack is a sling-style pack featuring a fully ambidextrous and comfortable to wear platform. Slim shaped for fast manoeuvring in crowds, the pack can be stored in vehicles and lockers, and thanks to its quick release buckle can be quickly taken on or off when needed. 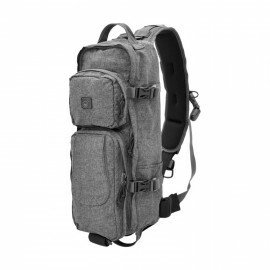 Wide padded shoulder strap comes with breathable air mesh, large lockable quick release buckle, MOLLE straps and 1" stabilizer strap with buckle and carabiner. Shoulder strap is cocked at either the right or left lower corner, so the pad aligns ergonomically in the correct body hugging direction. 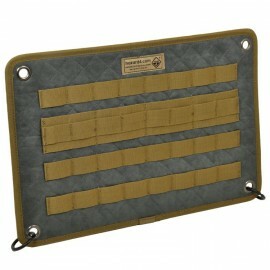 3D thermo moulded back panel allows for easy air-circulation and comfortable wear even when bag is fully loaded. Behind the padded back is a separate hydration bladder compartment, lined with soft material, with two-way zip closure, Nylon loop and a Velcro secured passage for a hydration tube. The Hazard 4 Evac Plan-B includes one large main compartment with two-way zip closure, soft material on all sides, removable padded internal divider and two mesh pockets: one with elastic closure and one with zip closure. Front of the bag comes with two separate zipped compartments, top one with Velcro patch area and bottom one with multiple admin sleeve pockets and 5x3 MOLLE straps on the outside. 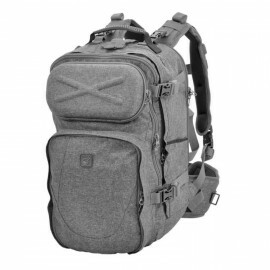 Additionally, the bag features two side pockets with elastic closure and MOLLE straps, two large grab handles for comfortable carrying and small top-zipper to pass long objects like antennas or barrels. Numerous compression straps allow the bag to be adapted to the size of carried kit and prevent it from shifting inside the bag, which may cause unnecessary noise, discomfort and disturbance to the balance. The webbing used throughout the bag is a class-leading strapping that is stiff yet soft on the skin and is very useful for attaching additional side pouches and other MOLLE compatible accessories. The bag can be rotated to the chest and accessed while on the move, all the pockets are designed to face the user in this mode on either the right or left side. This means the user can go from wearing the pack on his back, to driving a vehicle with pack on the chest in just a few seconds. Loads of internal organization and a quick access pockets provide just the right balance of storage for everyday requirements.